For the past four decades a band of orbiting sentinels has watched the world and sounded the alarm when enemy missiles take flight. Now, a new generation of advanced satellites that began launching Saturday will continue standing guard while also giving the U.S. military better insights into global hotspots. The Space Based Infrared System Geosynchronous-1 missile warning satellite, mounted atop an Atlas 5 rocket, thundered away from Cape Canaveral's Complex 41 launch pad at 2:10 p.m. EDT after years of daunting and expensive development. The towering launcher soared into the Florida sky and set sail toward a highly elliptical geosynchronous transfer orbit where the 10,000-pound payload was successfully deployed 43 minutes later. Controllers will spend the next nine days conducting six critical maneuvers to boost the SBIRS GEO-1 satellite into a circular geosynchronous orbit 22,300 miles above the planet where it can match Earth's rotation over the equator. Valued at more than $1.2 billion, this satellite begins the next era for warning spacecraft that continuously monitor the globe to alert the national leadership and battlefield commanders of missile launches. It evolves the orbiting system from the Cold War focus on intercontinental ballistic missiles to today's short-range missile threats by incorporating new technologies to make quicker detections of fainter objects. "There's a global imperative for performing strategic missile warning now and well into the future. We will always have the gold standard for missile warning," said Brig. Gen. (s) Roger Teague, director of the U.S. Air Force's Infrared Space Systems Directorate. "From a sensitivity perspective, SBIRS sees dimmer targets, dimmer events of interest much sooner," Teague says. "With that information it allows us to take and disseminate events of interest much, much faster and tightens our OODA loop (Observe, Orient, Decide and Act). It allows us to make appropriate decisions and take appropriate actions much, much faster." 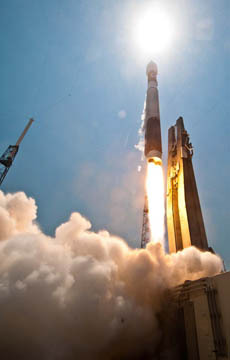 SBIRS GEO-1 was built by Lockheed Martin using the company's commercial A2100 satellite design with a 12-year mission life. It features a pair of power-generating solar arrays, two communications antenna wings that unfold and a deployable light shade to shield its sensitive infrared instruments. 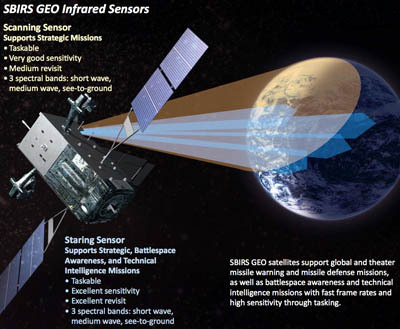 And unlike the previous generation of Defense Support Program missile warning satellites that have only scanning sensors, the SBIRS GEO spacecraft are equipped with both scanning and staring instruments to increase the amount of reconnaissance that can be collected. "SBIRS has the two payloads vice the one and it's got two telescopes -- one that's able to do like a windshield wiper-type scan, that's the scanner, and the starer is able to focus and sit there and look at any given area continuously as opposed to spinning around or scanning back and forth," said Jeff Smith, Lockheed Martin's vice president and SBIRS program director. The scanning instrument on SBIRS satellites will provide the global observations like DSP spacecraft have produced for decades. But the addition of the staring sensor enables the military to examine a very specific region for emerging threats and fast-moving targets. "The ability to task this system to do both global and theater missions and intelligence missions simultaneously is really the revolutionary part of this system," said Smith. "The real warfighting advantage," Teague says, "is the persistency of the SBIRS system, that I can persistently examine and surveille a given area of interest 24-by-7, where ever it might be needed in any part of the world, to be able to collect the valuable intelligence information so that our warfighting commanders -- both theater as well as strategic -- will be able to take the appropriate measures in response to any actionable information they might receive from the SBIRS systems. It really is a new era of warfighting and surveillance capability." The SBIRS system will augment and gradually replace the heritage Defense Support Program satellites over the next several years. "Last year, we celebrated the 40th anniversary of DSP. Today, we launched the next generation missile warning capability. It's taken a lot of hard work by the government-industry team and we couldn't be more proud," said Gen. William Shelton, commander of Air Force Space Command. Although officials do not disclose how many DSP craft remain in operation or their orbital locations, Teague said the vintage network still does the job despite the lengthy delays in getting the new SBIRS constellation developed. "Rest assured we've got a healthy missile warning constellation on orbit today. We have done a lot of work making sure we are doing everything we can to properly sustain and maintain our existing assets, so that we are extracting all of the operational value out of those systems we can. DSP is meeting our nation's strategic missile warning requirements today, and doing so very, very well. So it's giving us an opportunity to make sure as we field the SBIRS system that it will be done so right, and we'll get this right," Teague said. 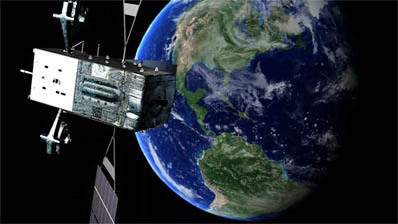 The initial elements of the SBIRS concept were deployed as hosted payloads piggybacking aboard a pair of National Reconnaissance Office eavesdropping satellites launched on Delta 4 and Atlas 5 rockets into highly elliptical orbits in 2006 and 2008 from Vandenberg Air Force Base, California. 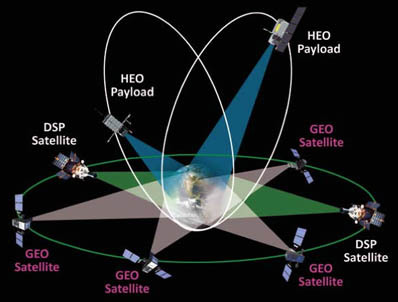 Those two SBIRS HEO sensors of the scanning variety have built a solid foundation, officials say, that show this next generation makes the promised advancement in surveillance from space. "We're able to see and do things now that we've never been able to do in our nation's history. It represents a real quantum leap in technology when you try to compare SBIRS and DSP. Obviously for classified operational reasons I can't get into too much detail, but that is what has created a real buzz of excitement from our operational warfighting partners as we look forward to fielding this SBIRS system. That is some real capability here that folks are itching to be able to take advantage of and dig into the data because we're able to see so much more," Teague said. "We get reports daily from warfighting commanders about how pleased they are with the quality of the SBIRS data with the sensors we already have on-orbit. There's a real appetite for being able to get the GEO system with the staring sensor on orbit, to get that capability into warfighters' hands. That's a new capability that we don't yet have and certainly will revolutionize and provide some real surveillance capabilities for the U.S. and our allies." Lockheed Martin is in process of constructing three more GEO satellites and two additional HEO payloads for future launches. Engineers think the difficult development woes are resolved and the formula is set to produce the forthcoming hardware in smooth fashion. "We now believe the developmental risks are now behind us and this program will be able to proceed forward with predictable certainty and we'll be able to deliver these systems when national security space requirements drive those need dates," Teague said. "This program has overcome a lot challenges over the years, certainly that's no secret. But we've done the testing, we've certainly paid the dues and we're about to field a system the nation will be very proud of for many, many years."